Although the Yankees have 147 games remaining this year — their season is only 9.3% complete! — it already feels like they need some outside help. 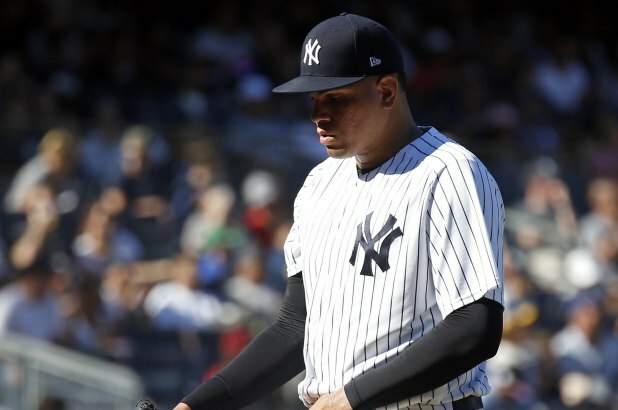 The injuries are mounting and, with CC Sabathia having returned over the weekend, it doesn’t seem like anyone is particularly close to coming back. The Yankees will be without several core players another few weeks. April is typically way too early to consider trades, though things are different these days. There is a single July 31st trade deadline now and we are in baseball’s post-competitive era. Roughly one-third of the league is unabashedly tanking. Anything to improve amateur talent acquisition opportunities (part of it) and trim payroll (most of it) is encouraged and even celebrated in some circles. March 27th: Traded Kendrys Morales to the A’s for Jesus Lopez and international bonus money. April 2nd: Traded Kevin Pillar to the Giants for Derek Law, Alen Hansen, and Juan De Paula. Law cleared waivers in February. Hansen was designated for assignment days prior to the trade. De Paula, who the Yankees sent to the Giants in the Andrew McCutchen trade, ranks 30th on MLB.com’s Blue Jays prospect list. Lopez is nowhere to be found on any prospect list. The Blue Jays saved $7.8M in those trades. That was their primary motivation. It stands to reason the Blue Jays will trade more veterans in the coming weeks. Stroman could go, Sanchez could go, Ken Giles could go, Freddy Galvis could go, and Justin Smoak will very likely go. Smoak is an impending free agent and Toronto has a ready-made replacement in Rowdy Tellez. There’s no sense in keeping him, and that creates an opportunity for the Yankees, who could use a player like Smoak. Let’s talk it out. 1. He’s an upgrade over Greg Bird. Let’s be real here, the “better than Greg Bird” bar isn’t especially high these days. Bird is hitting .171/.293/.257 (58 wRC+) in the early going this season and he owns a .194/.287/.388 (80 wRC+) batting line in 522 plate appearances since Opening Day 2017. That is bad production for a defense first middle infielder. It is appalling for a bat only first baseman. That homer against Andrew Miller only goes so far. Real talk: If Greg Bird had put up numbers like Smoak’s from 2017-18, he would be talked about as a cornerstone Yankee and an extension candidate. I know like 46.347% of you clicked over here saying to yourself “ewww no not Justin Smoak,” but it’s true. Bird would’ve been un-damn-touchable with Smoak’s numbers. Bird has not put up anything particularly close to Justin Smoak numbers though. Smoak is a switch-hitter who is most effective on the heavy side of the platoon, and he’ll draw walks without an excessive strikeout rate. Last week he reminded everyone he can turn around a 99 mph fastball and hit it out to the deepest part of the ballpark.
? That is a no joke home run. Smoak elevated a 99 mph fastball at the knees and parked it in dead center field. Could you even imagine Greg Bird putting a 99 mph fastball in play right now? I can’t, because he’s literally never done it at the MLB level. Statcast says Bird has made contact with a 99+ mph fastball once in the big leagues, and that was a foul ball in September 2015. Yeah. That “Healthy Yankees” lineup is almost certainly never going to happen, but a man can dream. The “Current Yankees” lineup though? Slotting in Smoak rather than Bird makes it look so much better. He fits in nicely between the two big righty bats, provides lineup balance as a switch-hitter, and oh yeah he actually provides some thump. That’s kind of a big deal. Bird to Triple-A and Smoak at first base is a clear multi-win upgrade. 2. He’s already familiar with the AL East. Is this is a reason to make a trade? Not necessarily, but it isn’t something to ignore either. This is Smoak’s fifth season with the Blue Jays (already?). He is an AL East veteran. He knows the ballparks and he knows the cities, and, most importantly, he knows the opposing pitchers. For the Yankees to get where they want to go this year, they’ll have to beat the Red Sox and Rays, and Smoak is familiar with those teams. That familiarity with the AL East could help his post-trade transition. It’s not nothing. 3. His contract is not onerous. Smoak reached some plate appearance salary escalators in his contract the last few years and will earn $8M this season. That’s all. The season is nearly three weeks old now and Smoak is still owed roughly $7.15M the rest of the way. Cot’s says the Yankees’ luxury tax payroll is at $226.7M right now, so they’re over the $226M second luxury tax tier. That $7.15M becomes $9.44M in real money when adding in the luxury tax. Even then, the Yankees should be willing to add $9.44M to payroll in an effort to stay in the postseason race. The way things are going right now, I’m not sure they can expect to be within striking distance of the division title by time guys get healthy. The Yankees need help now. Not weeks from now. Also, the Yankees could get the Blue Jays to eat some money to make it work. They’ve done that with various trades in the recent past and could do it again. Point is, this is rental player with a reasonable salary. If Smoak doesn’t work for the Yankees financially, I’m not sure anyone will. 4. It shouldn’t cost much to get him. What other contending teams need a first baseman (or a DH)? I suppose the Athletics could get involved if Matt Olson’s recovery from hand surgery doesn’t go well. They already traded for Morales though, so probably not. Maybe the Nationals or Rockies? That’s pretty much it. The Blue Jays are likely hoping some contender gets hit with a first base injury to create a trade market for Smoak. The Yankees, if you haven’t noticed, have a need for him due to injuries. What are the Blue Jays getting for Smoak beyond salary relief, realistically? Toronto is not getting anything close to a Paul Goldschmidt package for Smoak. Yonder Alonso was traded for a non-top-30 prospect over the winter. Steve Pearce was traded for a non-top-30 prospect last summer. C.J. Cron bounced around waivers over the winter. Smoak is a solid Major Leaguer, but I’m not sure the demand for first base only guys has ever been as low as it is right now. The Yankees have pitching prospects in spades. They could put a Rule 5 Draft eligible 40-man roster bubble guy like Nick Nelson on the table, or a lower level arm like Juan Then or Rony Garcia, and make the Blue Jays say no. The alternative is continuing to pay Smoak while waiting (and hoping) for a market to develop, and possibly losing him for nothing as a free agent after the season. I think the price to get him would be very easy to swallow. My guess is the Blue Jays are motivated to trade Smoak. The sooner they move him, the more money they save — trading Pillar and his $5.8M salary for minimal return tells you they consider no salary too small to dump — and it also opens up first base for Tellez. I imagine their rest-of-season plan is effectively a three-man first base/third base/DH rotation with Vlad Jr., Tellez, and Brandon Drury. Smoak’s not a long-term piece. Those guys are (or might be, at least). Last year’s J.A. Happ trade shows the Yankees and Blue Jays can get together for a trade. There’s no outdated “oh no we can’t trade within the division!” logic in play here. We know the Yankees and Blue Jays will trade with one another because we saw them do it recently. One way or another, Smoak’s time in Toronto is coming to an end soon. The Yankees need help now and Smoak would be an upgrade on both sides of the ball at first base without breaking the bank. It fits. The Yankees have a 1.5 game lead in the race for home field in the Wild Card game with 16 games to play. It’s effectively a 2.5 game lead, in fairness, as they do hold the tiebreaker over the Oakland A’s. As they enter their last homestand of the season, this series feels rather important – and not just because they went 4-5 on their last road trip. The Yankees are a better team at home, and having that edge in a win or go home game is huge. 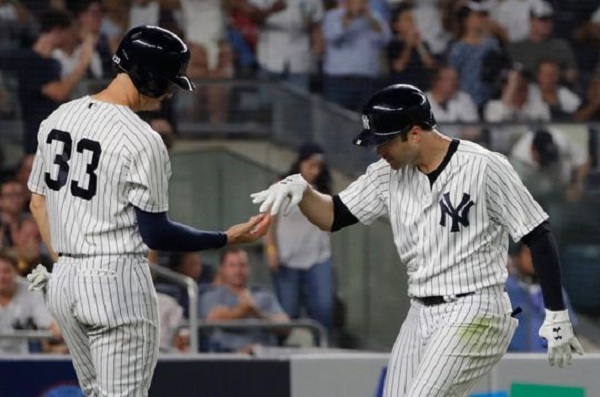 Game one was a rain-shortened affair, with the Yankees picking up the win due to some timely home runs by Neil Walker and Giancarlo Stanton and strong relief efforts from Chad Green and David Robertson. Due to weird scoring quirks, Robertson actually picked up the save despite not recording the last out of the game (it was called in the bottom of the 7th). Miguel Andujar had a big series, going 6-for-13 with 2 doubles, a home run, and 8 RBI. Didi Gregorius suffered his heel injury in the third and final game of the series, but he’s back now and that’s all that matters … right? Brandon Drury (hand), Marcus Stroman (blister), and Troy Tulowitzki (feet) are done for the season; Russell Martin is on paternity leave, but is expected back this weekend. The Blue Jays are 65-81 with a -105 run differential, which put them 22nd and 24th in the majors, respectively. Since these teams last played they made headlines for confirming that Vladimir Guerrero Jr. – who hit over .400 at Double-A and .336/.414/.564 in 30 games at Triple-A – would not get the call to the show for a variety of inane reasons; it’ll be interesting to see what, if anything, comes of these service time debacles. They also dealt Curtis Granderson to the Brewers, and Josh Donaldson to the Indians for a non-prospect in a trade that has made many teams quite angry. Rookie and 80-grade name Rowdy Tellez (249 OPS+ in 23 PA) should see time at 1B and/or DH. Russell Martin (87 OPS+), Devon Travis (83 OPS+), and Teoscar Hernandez (110 OPS+) figure to play, as well. Estrada is wrapping up the worst season of his career. He’s currently sitting on a 5.32 ERA (79 ERA+) in 130.1 IP with career-worst home run and strikeout rates. The Yankees have seen Estrada three times this year, scoring 9 runs in 18 innings; though, one of those starts was a one-run, 6 IP effort. This will be the fifth start of Reid-Foley’s career, and his second against the Yankees. His first time in the Bronx didn’t go too well (for him, at least), as he allowed 8 runs (6 earned) in 4.1 IP. Gregorius, Stanton, and Andujar all took him deep. Reid-Foley did follow that up with a gem against the hapless Marlins, though, pitching to the following line: 7.0 IP, 4 H, 1 R, 1 BB, 10 K.
Rare is the occasion when I write-up a post like this and come across a completely unfamiliar name, but here we are. Pannone is a 24-year-old rookie southpaw who debuted back on August 10, and has served as the Blue Jays swingman since then. He actually pitched against the Yankees back on August 19, holding them scoreless for 1.1 innings. Pannone opened this season with an 80-game PED suspension (which he denied – successfully – on a polygraph test, for whatever that’s worth), and only made 10 appearances in the minors before being called-up to the show. Pannone is a three-pitch junkballer, featuring a high-80s four-seamer, a low-80s change-up, and a low-70s curve. From that description, he kind of sounds like a left-handed version of Estrada. Ken Giles (5.32 ERA) and old friend Tyler Clippard (3.68 ERA) share the closing duties, and Ryan Tepera (3.71 ERA) is also in the high-leverage outs mix. Rookies Jose Fernandez (1.50 ERA in 6.0 IP) and Tim Mayza (3.69 ERA) have seen heavy duty this month, as well. It’s not a great bullpen – which is to be expected, considering their trade deadline – but it’s not awful. I’m interested in a longer look at Billy McKinney, and Rowdy Tellez has built-up a small cult-like following in his few weeks in the majors. Beyond that, the Blue Jays aren’t a terribly interesting team. Most of the focus on this series will be on the Yankees ability to hold the line. 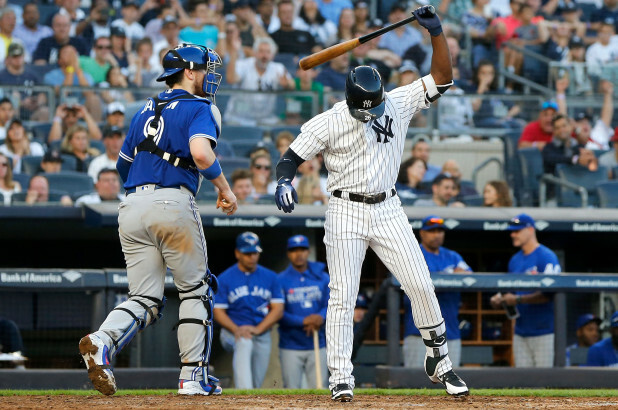 The Yankees snapped their mini losing streak and offensive slump with a rain-shortened 7-5 win over the Blue Jays in Friday’s opener. It was their first game called early because of weather since July 23, 2014 against the Rangers, a game that was stopped in the fifth. It’s the first time the Yankees won a game after giving up four or more runs in the first inning since … May 3 last year against Toronto. 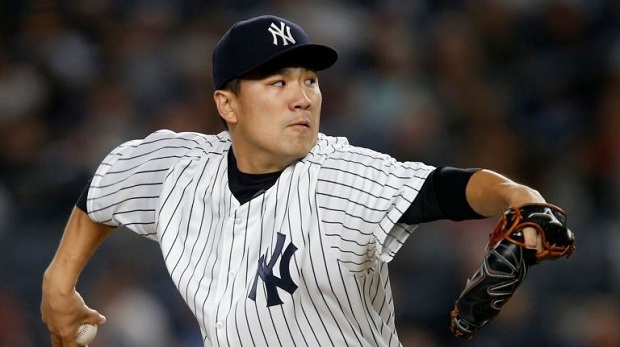 The opposing starter that the Yankees pounded that day in the Bronx? Yup, Marcus Stroman, the same guy that the Yankees blitzed on Friday. Didi Gregorius (RBI triple) and Miguel Andujar (RBI double) sparked the rally in the bottom of the first, quickly cutting the deficit to two runs. Gregorius’ triple was his fourth of the season, the same number he had in his previous three seasons combined with the team. Andujar’s two-bagger was his 35th of the season, putting the young third baseman in elite company. Neil Walker turned a 4-2 deficit into a 5-4 advantage with one swing of the bat in the fourth inning. His three-run shot off Stroman was his seventh homer of the season but his first as a Yankee that gave the team a lead. Giancarlo Stanton capped off the scoring with a mammoth solo shot to right-center in the bottom of the seventh, just before the rainstorm halted the game. It went a projected 431 feet, the fifth time this season he hit a homer of at least 430 feet to center or the opposite field, tied with Bryce Harper for the most in the majors through Friday. The Yankees continued to bash Blue Jays pitching, scoring in double digits for the first time in more than six weeks en route to a homer-fueled 11-6 win on Saturday. They hit four home runs, giving them 201 through 123 games played. The only team in MLB history to reach the 200-homer mark quicker was the 2005 Rangers, who needed 122 games. 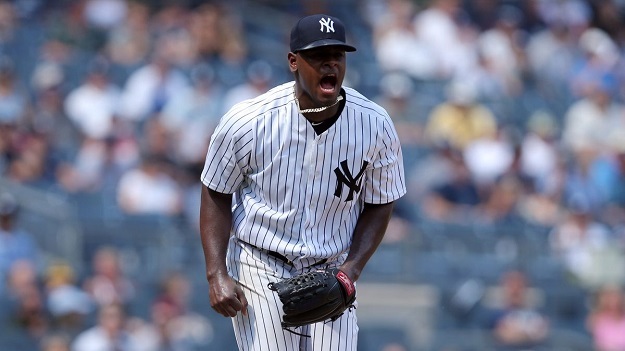 Luis Severino, who entered the game still struggling through a deep month-plus slump, bounced back from a terrible outing against the Mets earlier in the week to throw one of his best starts since the beginning of July. Though he struggled with his pitch efficiency (needed 100 pitches to get 15 outs), and gave up a bunch of hard contact (5 of 12 balls in play had an exit velocity of 98-plus mph), he was able to limit the damage to two runs while getting eight strikeouts. The most encouraging number might be zero, as in the number of home runs he allowed. It was his first clean outing since July 1, and he had coughed up 11 dingers in his previous seven games before Saturday. His fastball command seemed to be improved, as he mostly avoided the meatball four-seamers that had plagued him recently. 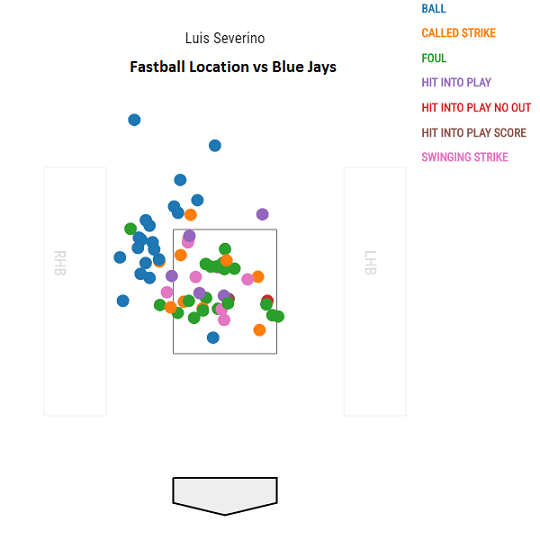 Even when he did leave a few of them over the heart of the plate, he was able to generate a whiff or a foul, giving up just two singles on his heater. 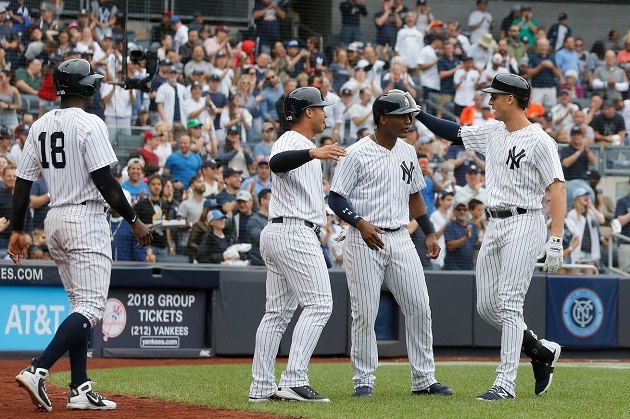 The Yankees completed the three-game sweep and finished off their 11-game homestand with another easy blowout win on Sunday, 10-2. They’re now a season-high 32 games above .500, the first time they’ve reached that mark since they ended the 2011 season with a 97-65 record. They put up nearly identical box score numbers as the previous game, exploding for 10 runs and 12 hits (had 11 runs and 11 hits on Saturday). This was the 629th game in the history of the Jays-Yanks rivalry, but the first time the Yankees scored at least 10 runs in back-to-back games against them. The Yankees wasted no time in lighting up the scoreboard as the first six batters each scored in the opening frame before Kyle Higashioka flew out to center for the first out. You have to go back more than two decades to find the last time the Yankees scored at least six runs to start a game prior to making an out — on May 17, 1997 against the Rangers in Texas. The last time they did at at Yankee Stadium was September 25, 1990 against the Orioles. That Rays series was a bummer, right? Yuck. Two opportunities to win the series with one clunker and another lifeless heartbreaker. Luckily, the Yankees’ schedule moves down the AL East standings to the Blue Jays, who got into New York late last night. They had their series finale in Kansas City delayed by rain and then had to fly all the way to NYC. Good chance to catch a tired team. The Yankees will face Marcus Stroman, who the Bombers roughed up in April. Read more about that in Domenic’s series preview. Good stuff as always from Dom! Meanwhile, Lance Lynn toes the rubber aiming for his fourth straight good outing as a Yankee. He closed his forgettable April with a loss to the Jays, but he’s looked like a different pitcher over the last month. A strong 0.54 ERA since the trade deadline. There’s a chance of thunderstorms right around first pitch, though it’s only about 50-50. An opportunity for a small delay, but they’ll should be able to get this game in, interruption or no. The first pitch is scheduled for 7:05 PM EST and the broadcast will be on WPIX, not YES, though you can catch pregame and postgame on YES. Jays Roster Moves: The Blue Jays called up Billy McKinney this afternoon to replace Luke Maile, who is on paternity leave. That gives McKinney the opportunity to play his first game at Yankee Stadium after making his only appearance as a Yankee at Rogers Centre. Update: 10 p.m. Game is in a rain delay with the Yankees leading, 7-5, in the bottom of the seventh. Rain is coming in steady, so it may be a while until they continue or call it. Update: 11:10 p.m. Game is called and it’s a Yankee win! Won’t have the recap up for a while, so here’s a one-sentence recap: Bullpen and offense made up for early Lynn struggles while Stanton and Walker both went deep. Huzzah. With yesterday’s loss, the Yankees are officially a .500 team in the second-half, sitting at 13-13 since the All-Star break. They have a +3 run differential in that time, so it isn’t all bad luck, either. This upcoming stretch is a great opportunity to turn it around, though, as their next five series (or sixteen games) are against teams that are comfortably below .500. The Blue Jays are up first. David Hale, in his last appearance with the team, saved the bullpen in the first game. Sonny Gray was pulled after the second inning, and Hale got the call – and he soaked up 5.2 innings, allowing just one run. You can’t ask for much more than that from a journeyman up-and-down guy. Domingo German had one of the best starts of his young career in the final game of the series, allowing one run on five hits and two walks in six innings, striking out five. Gardner gave the Yankees the win with a 10th-inning single. Check out Katie’s Yankeemetrics post for more interesting facts. 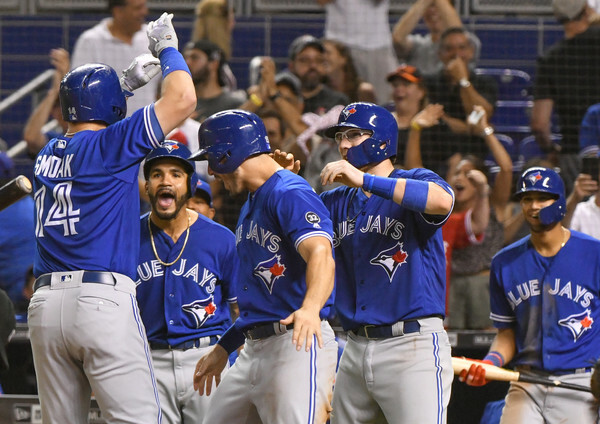 Josh Donaldson, former Yankee Brandon Drury, Aaron Sanchez, Yangervis Solarte and Troy Tulowitzki are all out with injuries, and none are expected back for this series. The Blue Jays are 55-66 with a -76 run differential, having waved the white flag heading into the trade deadline. They dealt Seung Hwan Oh, J.A. 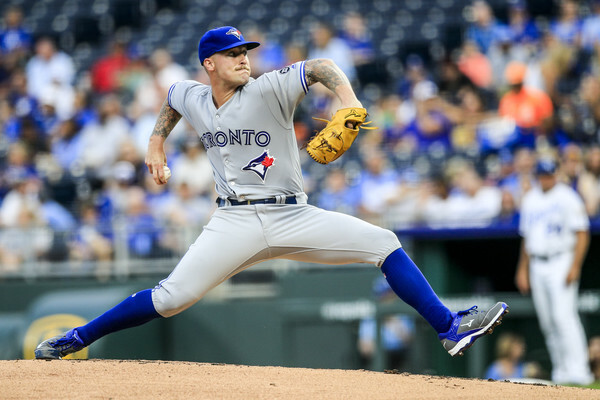 Happ, Roberto Osuna, John Axford and Aaron Loup in late-July and, were it not for his injury, they may have dealt Donaldson as well. And they’re still active now, as they’ve been shopping Curtis Granderson after passing him through waivers. Now’s as good a time as any to say that Granderson would look really good in pinstripes. Vladimir Guerrero Jr. is batting .353/.452/.627 (201 wRC+) in Triple-A right now, with more walks (10) than strikeouts (7) in 62 PA. This, after hitting .402/.449/.671 in 266 PA at Double-A. It’d be pretty great to see him at the highest level. Russell Martin is still playing non-catcher positions fairly regularly, and I think that exemplifies the hand that manager John Gibbons has been dealt this season. Randal Grichuk (97 OPS+) will probably start and play right field against J.A. Happ on Sunday. Luke Maile (84 OPS+) will see time at catcher, too. The Yankees have faced Stroman twice this season, and they’ve hit him hard both times. His line in those two starts: 10.1 IP, 8 H, 12 R (10 ER), 7 BB, 13 K, 2 HR. It’s been a rough year for Stroman on the whole, as the 27-year-old has pitched to a 5.03 ERA (84 ERA+) thus far while also spending about a month and a half on the disabled list. He has looked better of late, though. The 22-year-old Reid-Foley made his big league debut on Monday, having earned the call-up by pitching well at both Double-A (2.03 ERA in 44.1 IP) and Triple-A (3.50 ERA in 82.1 IP) this season. He was a second-round pick out of high school back in 2014, and he has slowly but surely risen through the Blue Jays organization to find himself here today. Reid-Foley was a bit disappointing in 2017, but he was a consensus top-100 prospect prior to last year. Reid-Foley is a four-pitch guy, featuring a mid-90s four-seamer, a mid-80s change-up, a mid-80s slider, and a low-80s curveball. Borucki’s third big league start came against the Yankees on July 8, and it was a good one. The 24-year-old rookie tossed seven innings of one-run ball, scattering seven hits and walking two, while striking out five. He’s been quite good for the Blue Jays so far, pitching to a 3.29 ERA in nine starts, and averaging just under six IP per start. He doesn’t strike anyone out (14.5 K%), but his walk and groundball rates are a tick above-average, and it’s working so far. The Blue Jays dealt four relievers leading into the deadline, and it shows. Tyler Clippard (3.44 ERA) and Ryan Tepera (3.98 ERA) are splitting closing duties for now, and they’ve been serviceable. It’s a bit of a horror show behind those two, though, with Joe Biagini (5.70 ERA), Jake Petricka (4.88 ERA), and Ken Giles (10.80 ERA with Toronto) seeing lots of action. They have a bottom-ten bullpen on the season, and that’s with a few months of Osuna, Oh, Loup, and Axford. Can the Yankees round back into form against a bad team? That’s the biggest question heading into this series, as they really need to take advantage of this favorable schedule. The Blue Jays aren’t as bad as some of the other teams coming up, but they’re a subpar team that has punted already, and that shows. And maybe – just maybe – we’ll see Granderson traded back to the Bronx midway through the series. Wouldn’t that be neat? Earlier today the Yankees acquired RHP George Kontos, then, a little while later, they acquired 3B Gio Urshela from the Blue Jays for cash, the team announced. He’s not on the 40-man roster and he’s going to Triple-A. Urshela, 26, hit .233/.283/.326 (66 wRC+) in 19 games with the Indians and Blue Jays earlier this year before being outrighted. He’s a great defensive player. You may remember this. Urshela effectively replaces Brandon Drury with the RailRiders.